I used what I had in the fridge to make myself a light and filling salad. I like the smoky flavor of roasted bell peppers and they make a great addition to today’s lettuce salad. 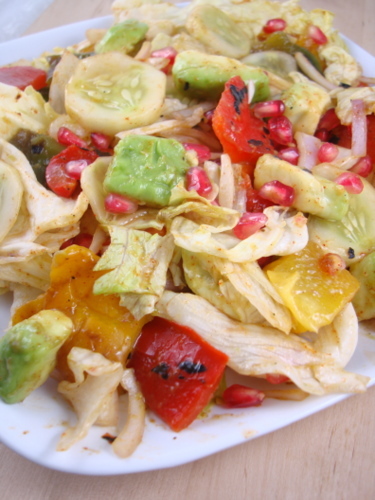 Avocado provides the healthy fat and pomegranate is rich is antioxidants. If you are looking to detox your system or lose weight with healthy food then hop over to check out some raw food recipes that I have blogged earlier. Roast one red bell pepper, one green bell pepper and one yellow bell pepper. Cool and peel the charred skin and chop. Place in a large salad bowl. Peel and slice a cucumber, add to the bowl. Peel, cut an avocado into pieces and add to the bowl. Peel, slice a red onion and add to the bowl. Wash, pat dry a head of iceberg lettuce and tear into bite sized pieces and add. For salad dressing, whisk 1 1/2 tbsps olive oil, 1 tbsp eggless mayo, salt to taste, crushed garlic clove, 1/2 tsp paprika, 1 tbsp lemon juice and 1 tbsp honey. Pour this dressing over the raw lettuce salad and toss well. Sprinkle a few pomegranate seeds and refrigerate until use. Serve lettuce salad chilled. Optional: Finish with a sprinkling of toasted sesame seeds. I had been a great fan of your raw food recipes.. had been missing it.. thanks for another cool one..
Wat a refreshing flavourful salad, i dont bother to finish that whole plate rite now.. I love salads! It is one of the easy to prepare dishes that never fail to satisfy my cravings! 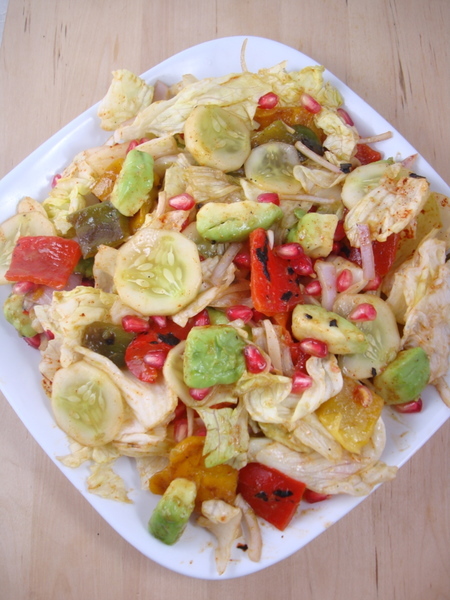 Lettuce and roasted bell peppers seem like a great combination that can boost the appetite of people.